This is 'KantaiCollection' Fan Mod. You will be able to create KantaiCollection's items, Japanese style decorations, dishes etc. Please put the jar file in Minecraft's mods folder. I think that they can be used in [client / server]. For 1.11.2, 1.10.2 and 1.9.4, it is scheduled to be released at a later date. ・A green tea can does not have a recipe that turns into green tea. ・A black tea can does not have a recipe that turns into black tea. Add in the next update. ・Change "Cooktop/Oven" to "Cooktop" to ignite with sneaking right click. ・Changed the design of "Cutting board" & "Sink". ・Fixed the problem that You are buried in the ground when you get up from ZABUTON and ZAISU. ・When a Stockpot with water is broken, it is changed to be a Stockpot. ・ChonjufuMod Aluminum is shared with ImmersiveEngineering and ThermalExpansion etc. ・Added Cherry, Acer, Ginkgo, Cheese, Pizza, YUKATA, new Armor and new Gun etc. In addition to ChinjufuMod.jar, ChinjufuMod_Kongou.jar and ChinjufuMod_Fusou.jar are available. If you want Cooking and Cherry blossom tree etc, please use ChinjufuMod_Kongou. 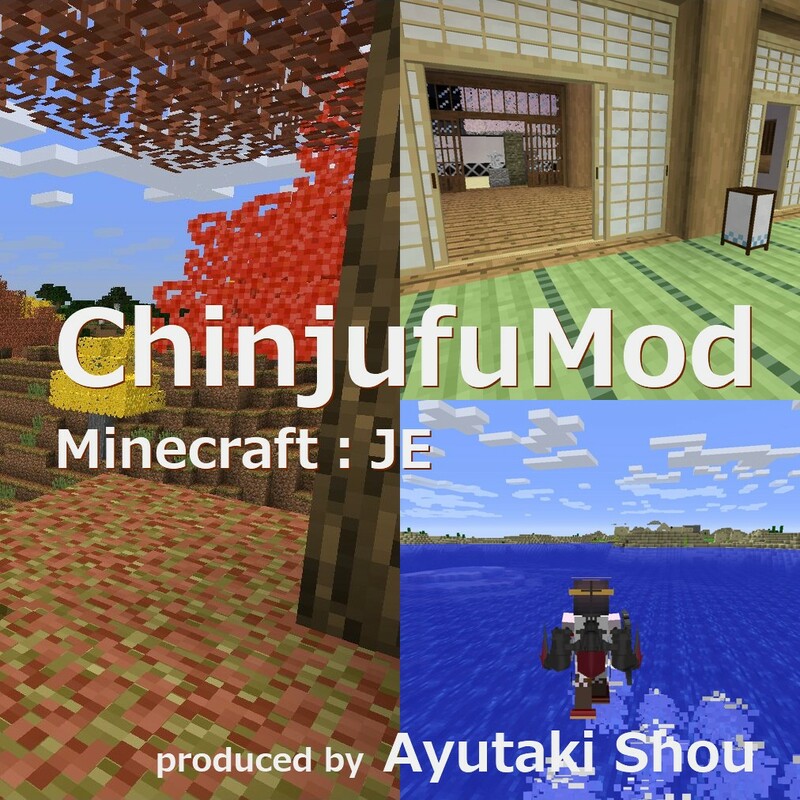 If you want Japanese style blocks, please use ChinjufuMod_Fusou. If you want both, please use ChinjufuMod. It translates into the following 10 languages. It also includes things that need adjustment. introduction please judge in the self-responsibility. ・Personal play, use in multiplayer is free. ・Use in play movies, live broadcasts, use on blogs and SNS is free. ・Use of other than Minecraft is free. ・That you received this MOD as it is secondary distribution, please refrain. ・My copyright and moral rights are not abandoned. ・There is a possibility to stop delivering 'ChinjufuMod' by request from 'KantaiCollection'. Because the amount of information is large, I compiled recipes etc in my wiki. I want you to refer to the link destination. I'm sorry in my poor English. Thank you. Because I have never used the multi play server, I do not know much about the trouble that occurs in it. I don't know if it will help you, but I will tell you this. Acquisition of ID is entrusted to Minecraft, and I have not decided the ID. One question. Is it better to default to "TRUE" to avoid the trouble you encounter? It was easy to crash if there was a lack of biome/bauxite in the world, and it was safer to have an extra biome/bauxite in the world. I needed to think hard and notice that. The next update will change the default to "TRUE". Will we have some shields that able to block made by ship parts? There is no shield yet. Because 'KantaiCollection' has few characters to equip shields in hand. About a shield, I have an ideal image for me. However, I am not sure whether I can make it as ideal. Because I have not tried it yet. Thank you :D, I wish we can use more kind of equipment in the future. How do I get salt,is there a way to craft it or it can be found somewhere? I visited the wiki but there was nothing about salt there. Please look at "DONABE with Seawater" in this page. How do I get grapes, tomatoes etc? I can't seem to find any seeds. EDIT - ok I found out you make seed sack rather than punching grass. Wonderful mod! Any chance of seeing support for Better Foliage? I have received similar requests in the past. I am not interested in making real trees. So, I will not do it. does this mod add sushi? No. It does not add Sushi. Will this mod update to version 1.13 and support Modloader Rift? I have not studied MOD development using "Modloader Rift" yet. I want to make version 1.13, but I still can not answer about it. Hello! Thank you for the mod. I love this mod! Recently i installed 3.2.2, but the shikkui slab block is not included. It has changed to shikkui log block. I wonder if the shikkui slab block is removed ? Or there is a problem with my forge. In 3.2.2, the change to "the shikkui slab block" has changed only CreativeTabs. As my world is, I do not think there will be any impact on the blocks I put in the world. I have the world I used for the "ChinjufuMod[1.12.2]3.1.4.1.jar" run test. I entered that world using "ChinjufuMod[1.12.2]3.2.2.jar". But, block replacement did not occur. I do not know the cause of what is happening in your world.